Watching Cerith snails laying eggs this week, depositing them on the glass and rocks has been good to see. It’s a good sign that things are going well in our tank! If they survive we will have tiny little Cerith snails to add to the clean-up crew, or bite size snacks for the Emerald Crabs. Their fate is yet to be seen! Our Scooter Dragonet is eating fish pellets! 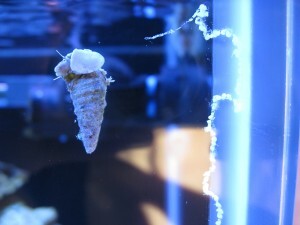 This entry was posted in Informational and tagged aquarium, cerith snails, eggs, saltwater. Bookmark the permalink.